Top 5 Best Excel Repair Software for Data Analysis & MIS Companies. Excel is one of the most sought-after spreadsheet software. End-users from an accountant, entrepreneur, and student to a financial planner, all rely heavily on this application to carry out business needs. Whether it is a simple job like creating records, setting goals, preparing a budget, calculating salary, or analyzing data, this spreadsheet software is highly capable. However, just like other applications, in odd situations, this reliable tool gets haywire, fall prey to unexpected errors and eventually result in critical data inaccessibility. In the list of best 5 Excel Repair software, Stellar Phoenix Excel Repair is on top. This software is a perfect choice to repair damage as well as corrupt Excel files. The unique trait of this professional software is 100% data integrity, i.e. tool repairs.XLS/.XLSX files without modifying engineering formulas, filter, cell comments, user defined charts, sort, image, tables, etc. For free trial, you may visit here. Includes smart options like Find File, Search File, etc. Office Recovery Excel Recovery is another efficient software. Similar to Stellar Phoenix Excel Repair, this handy software also saves recovered data into a new blank Excel spreadsheet. With hands on this software, formulas, numbers, text, frozen rows & columns, sheet names, embedded images, merged cells, comments, images, filter settings, and hyperlinks are quite easy to repair. When there is a need to recover inaccessible data on the workbook, Secure Data Recovery Excel Repair is also a better alternative. This Data recovery software for corrupted Microsoft Excel files promises recovery of corrupted files for a variety of formats, ranging from .xla, .xls, to.xlsx. Use this tool, to recover Multi-Sheet File Structures, Hyperlinks, Conditional Formatting, Text, Numbers, Formulas, Merged Cells, Filters, Frozen Rows/Columns, and Formulas along with Pages, Workbooks, and External Links to Files. With a great recovery rate, Datanumen Excel Repair is among one of the top 5 Excel Repair software. Whether workbook shows error like “This file is not in a recognizable format” or “Excel found unreadable content in ”, this software is a viable choice. Just like other mentioned Excel repair software, this tool recovers as much data as possible without minimum loss. Facilitates Cell data, formulas, etc. Just like afore-mentioned software, Kernel Excel Repair is also very intuitive when it comes to damaged or corrupt workbook recovery. Use this software to restore texts, formulas, OLE objects, numbers, filters, URLs, etc. This software also ensures no modification of workbook’s properties and original data. Recovers merged cells, comments, and conditional formatting, etc. 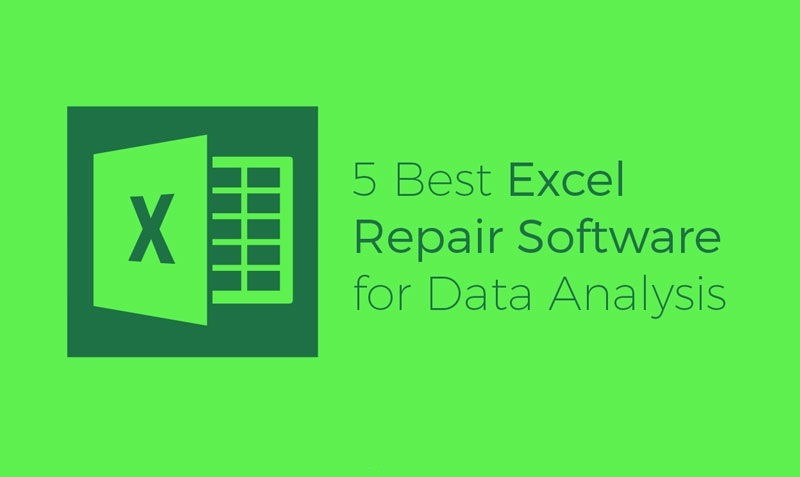 With that said, these are top 5 picks for Excel Repair software for Data Analysis & MIS Companies. Each of these software has unique traits. Depending upon needs and targets, end users can select desired software. Every software listed above makes sure to repair MS Excel with great ease. Choose a viable option from the list and bid goodbye to corrupt or damaged Excel right away!